PRINTING TYPE : HUMID INK, ROLLER ROTATING GRAVURE TYPE. 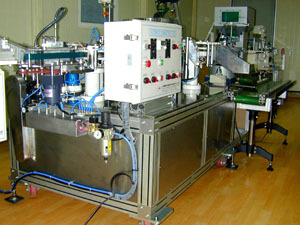 PARTS FEEDING : AUTOMATIC CENTRITNGAL FEEDING SYSTEM. TYPE OF M/C : CONSECUTIVE ROTATING INDEX GUIDING SYSTEM.